My library/study is the small 3rd bedroom in our house. 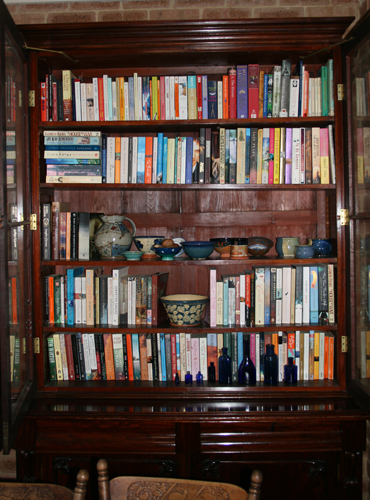 What you see is about 2/3 our book collection – the rest in in other book cases throughout the house. I have been busy cataloguing everything on Librarything.com. In this room I have got about half way through. Thus the books on the right hand side are quite orderly, even if doubled up, and the left hand side – from about half way along the facing wall – is a mess. The bikes will have to move sides for the job to continue! About the library: As you can see, it’s crammed full of books 3 or 4 levels deep and, like yours, sits just behind the dining table in the main area of the room. Others are in bedrooms, one above my study, in my childrens’ rooms and even in the kitchen (I’ve got a stack of cookbooks in the food cupboard! ).